As a birthday experience, my sister and brother-in-law proposed a day out on jet-skis. They live a five-minute drive from the Solent and are both keen jet-skiers. He works as a service engineer at Watercraft World, where he looks after customers' jet-skis. My sister owns one, a Sea-Doo Spark, made by Bombardier, a Canadian outfit. The plan was that the three of us would go out, me on my sister's ski, my sis on a borrowed used one from Watercraft World (thanks, Nigel), and Julian on his. I've never been on one before, but they're not hard to get used to. They accelerate like crazy. You hold the handlebars, squeeze the throttle (a trigger-like affair) and it feels like your arms are being yanked on the end of a piece of rope. On the chop, you can be going at a moderate pace, but on the rise of a wave if you squeeze the throttle, you can take off into the air from the lip. Conditions were perfect; a slight offshore wind meant that the inshore water was dead flat, although there was a bit of chop towards the Isle of Wight. There was a clear blue sky, and is was warmer than we had any right to expect in March. We went over towards Cowes, stopped off to look at Queen Victoria's bathing hut, and then went back over to Portsmouth, and back to Lee along the shoreline. The fastest I could get it was 49 mph. Exhilarating. Probably not a sport that I'll pursue over the long term, though it was fun for a one-off. The Spark is quite a light craft so it gets chucked about a bit in the chop, and my joints took a hammering. It was a good laugh though and I can see that a day on the water followed by a barbecue is a good way to unwind from a stressful day, or week. On our way back from Gravetye we dropped in to the RHS garden at Wakehurst that is just up the road. They house a big seed bank, collecting plant seeds from around the world to protect and preserve species diversity. There is also a subset of the RHS's botanical gardens there. The seed bank is an impressive operation, and is well explained in a series of panels. The whole operation is supported by various means, including admission fees and donations. Give generously, or visit often. The garden itself is dotted with sculptures and other forms of garden art. I rather liked this one with the bear looking out of the tree, and these toadstools. There's a big owl in a tree, too. It happens that my birthday, and those of my sister and of my wife all fall within a few days of each other. It makes a good excuse for a big celebration when the mood strikes. It was my call, and as a special treat, I decided I'd like a weekend away so we bundled off, me, Anita, my sister and her husband, for a night at the Gravetye Manor Hotel, not far from East Grinstead. It has a Michelin starred restaurant, and a famous garden. What's not to like? 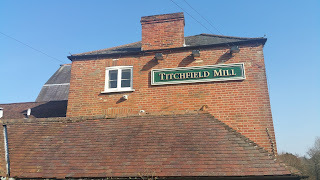 It has also, we found out when we arrived, friendly staff and comfortable rooms. The gardens were originally designed by one William Robinson, of whom I had never heard. He had held several prestigious appointments before he started working at Gravetye Manor, and his enthusiasm for gardening led him to publish a weekly journal "The Garden", that he edited for 29 years. His publishing business made his fortune, and he ended up buying the manor. I tip my hat. It has to be said that March isn't the best time of year to visit and English garden, but you can get a feel for the lie of the land, and at least the daffs, camellias and crocus were out. The round, walled veg garden was impressive, if only for the fact that there was not a weed to be seen. How do they do that? I especially liked the "Onion gate" at one end of the walled garden. There comes a time when familiarity with the French language causes a double-take in English. The prefix "gastro" refers to stomach-related things in both English and French; in English, the context is usually gastronomy, the appreciation of good food. In French the context is gastro-enteritis. So if a French person tells you they have a gastro, they are telling you that they are suffering from vomiting and diorrhea in unspecified proportion. 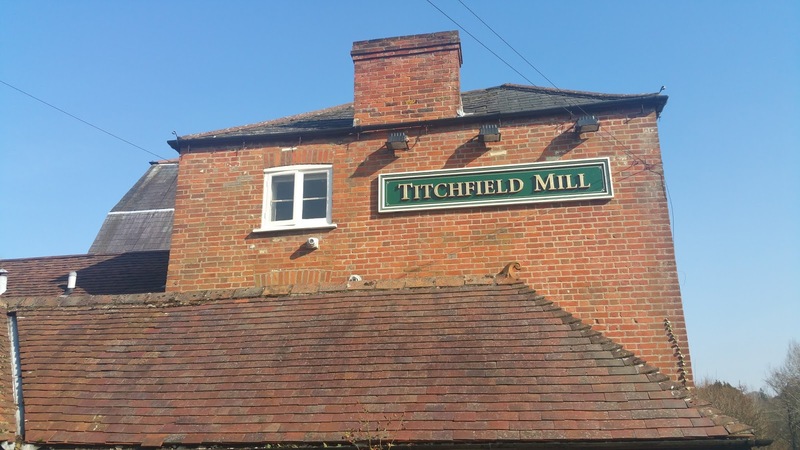 We had lunch with my mum and her partner Ron, in Titchfield Mill; a gastro-pub. The French would think we were mad. A fine meal it was too, although the service was slow. We got the impression that a group of poshly-dressed people in a different part of the pub were getting priority. After lunch we went off to Abbey Nurseries, a garden centre, just down the road by Titchfield Abbey. It was sunny and warm enough that we drove with the roof down, since Ron wanted to see how it works. In the nursery I finally found a red Tree Paeony for my pal Leo, who has been looking for one for ages, and I bought a white one for myself too. I'm sitting in the rehearsal of our Harmonie at Evron, musing during a few bars' rests, on our plans for the upcoming concert. We are rehearsing a composition by the American lady Alex Shaprio. 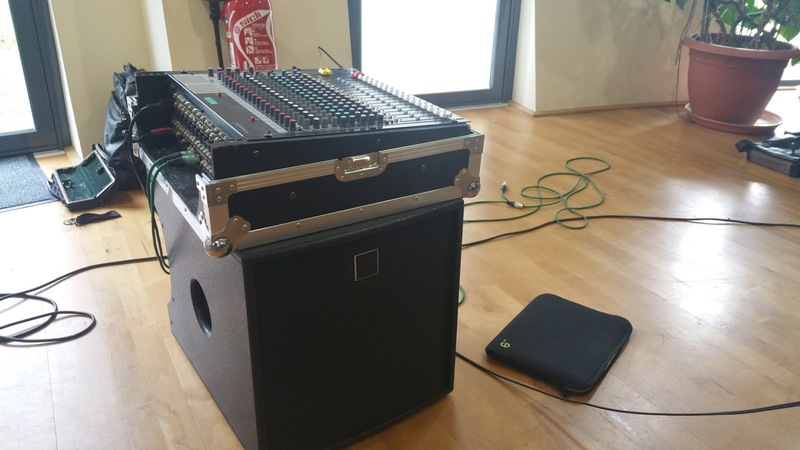 We have at our disposal the sheet music to play from, of course, but we also have a multi-track recording of the piece, stored on a PC operated by the conductor. So we can, once we've got the notes and rhythms down, play along to the sound of the enormous drums and sound machines that we don't have at Evron, as conceived by the composer. There is a "click track" as well, one click per beat, so we can keep in exact time, and for the live concert this will be fed to the conductor (chef d'orchestre) through his earpiece, so no-one else can hear it. Our chef has discussed the pieces with the composer over the phone, there are promises to send her a recording of our performance. Developments in music technology bring changes, of course. Popularisation of the record together with electronic amplification led to the rise of the DJ, and the corresponding demise of the many small bands that were employed whenever music was required at any social event. Now the two forms of music delivery live side-by-side; there is a well-understood place for each. Once PCs became fast enough, (called "multimedia PCs" at the time), that technology plus digitisation of music and data compression techniques led to the MP3 music file and player, all of which revolutionised the distribution and enjoyment of music for the buying public. Now that the internet is becoming fast enough, streaming technology is starting to obviate private collections of music, since it can now be downloaded and played on demand. With still faster PCs, sampling and sequencing have revolutionised the way music is created. The "buggy whip manufacturing" lobby is always present with changing technology, forecasting the end of the world as we know it with every advance. These technologies make music easier to create and distribute; this can lead to large amounts of musical dross, but at the same time, I believe that musical genius will reveal itself. The modern composer and performer has all the old tools still available, plus some powerful new ones. Nothing wrong with that. A light dusting of snow during the night has been followed by much warmer air and blue skies. It's melting off the trees and will be gone by lunchtime.